It took me awhile to discover podcasting, but ever since I bought my first iPod a little over a year ago I've found quite a few podcasts that I enjoy on a regular basis. They're especially good listenin' in my car while driving around on business and such. So I thought it might make a fun lil' feature, every now and then, to write about the podcasts that I'm especially fond of. There was no question which one I wanted to spotlight first: Daily Breakfast with Father Roderick. 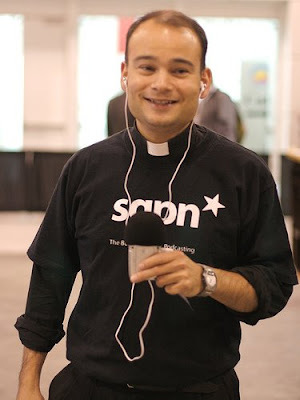 It's considered by most to be the #1 Catholic podcast on the Internet. And though I'm not a Catholic this is bar none the most rollickin' fun and captivating regular podcast that I've ever come across. In addition to his theological perspective as a Catholic priest, Father Roderick Vonhögen also comments on pop culture and trends such as Star Wars (he and I used to be on TheForce.net staff together, where he did the amazing "Virtual Prequels" feature), music, video games, iPhone apps, and health and nutrition. Avid runners will especially find Father Roderick's reports on his personal training to be of great interest. No matter who ya are, Father Roderick offers up something for everyone! If you've got iTunes on your computer, click here for the Daily Breakfast podcast.